This is the third of a four-part series highlighting the NHLPA and UHL 2018-19 All-Star Hero campaign, which through the NHLPA Goals & Dreams fund, recognizes military personnel and their families for their services. Today’s story spotlights Master Corporal Stephen Giza of the Canadian Forces. Master Corporal Stephen Giza has given 15 years of service to the Canadian Armed Forces. Upon learning he was one of four veterans selected to attend the 2019 All-Star Weekend – and true to the selfless reputation detailed in MCpl. Giza’s nomination – he was more excited for giving the experience to his special plus-one. 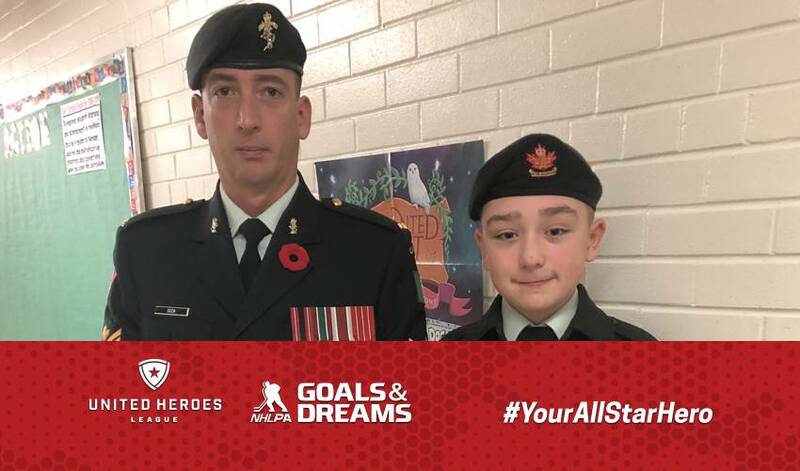 To this day, the resident of London, Ontario, continues to inspire young soldiers with his words and actions – just one of the qualities that moved his wife, Lisa, to submit his story for the All-Star Hero campaign. During his time as a Vehicle Technician, he has completed several Canadian and International Operations. He served in Afghanistan in 2007 as one of the lead vehicle recovery technicians. During that tour, he was struck by 2 IEDs on two separate occasions, the second of which had him medically repatriated with serious lower extremity injuries. For his selfless service and bravery, he received one of the most prestigious honours, the Sacrifice medal, for his actions during wartime under enemy contact. He also received the Army Commanders Commendation and a wound stripe for his injuries. Giza, who has conducted numerous Canadian operations, has deployed to Canada’s most northern inhabited base, CFS Alert (Nunavut) and also to Eureka, Iqaluit. In 2015, Giza deployed to Ali Al Salem Kuwait where he completed a six-month tour of duty. Throughout his military service, Giza has earned a reputation as an outstanding soldier who continually puts mission before self, and a dedicated leader who has instilled the same ethics and values in his own subordinates. UHL founder/president and decorated U.S. Army serviceman Shane Hudella, who was also on the call, also took note of Giza’s commitment to his country. You can follow MCpl. Giza's story and 2019 NHL All-Star experience on social media by following @NHLPA on Twitter or Instagram, and tracking #YourAllStarHero.